Few things are more satisfying than stew, and this vegan recipe featuring root vegetables, chick peas, and the warm flavors of North Africa will tantalize your taste buds and soothe the soul. 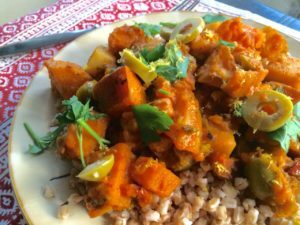 With its seductive spices and and richly hued root vegetables, this fragrant dish bursts with autumn flavors and colors: Moroccan stew is just about perfect for supper on a chilly October evening. Which it may well be, wherever you live, whenever you’ve stumbled across this article. It’s mid-May here in Boston—which also falls firmly into the “chilly evening” category when you live in the northeastern United States. While trendy magazines are talking about first-of-the-season farmers market treats, New Englanders enjoy hot soups and stews on many spring nights when the temperature still drops to near-freezing. We won’t be seeing local asparagus or strawberries any time soon, and many of us continue to turn to root vegetables from the previous growing season to nourish and sustain. 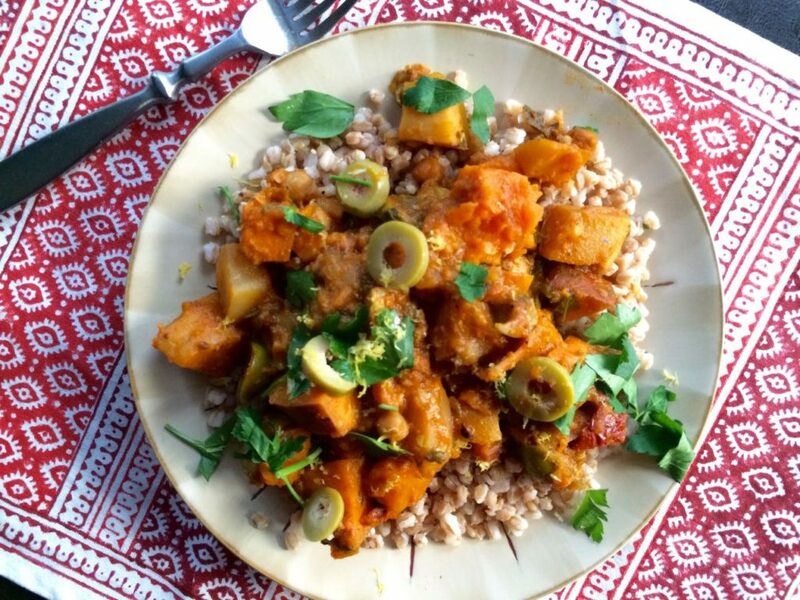 Enter this soul-satisfying Moroccan stew, which I defrosted for tonight’s supper (after a year, I might add) and served atop a bed of farro. 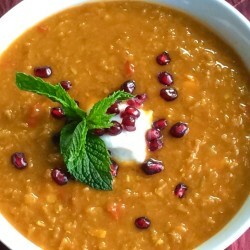 I think you will be very happy to have made this recipe—especially if you love my Moroccan red lentil soup. This dish is not only seriously yummy, it will provide you with dinner, leftovers, and some for the freezer (depending on your family size, of course). There are a crazy amount of ingredients in this recipe, I know, but many of them are spices so don’t be scared off! It’s a fun dish to make and its tantalizing aroma will make you swoon as the dish simmers on the stovetop. 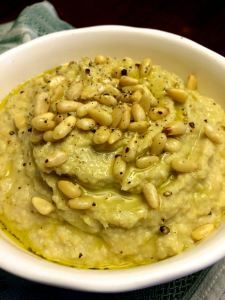 And you really do need them all to get the complex flavors of North African cuisine, so don’t skimp: most of the spices can be found easily in your grocery store. And when they’re stirred into a mixture of root vegetables and traditional ingredients like raisins, green olives, and sundried tomatoes, the resulting stew is a real party on your palate. Prepare all ingredients. This recipe comes together simply once you prepare your mise en place (i.e., get everything prepped at the outset such that each element can be added to the mixture at its turn). Pulverize first five spice ingredients in a spice grinder and set aside. Cut vegetables into large, bite-sized chunks; no need to discard peels, which are chock full of nutrients and reduce your food waste. Note that you can also cut down on cooking time if you want to begin with roasted vegetables, perhaps those left over from Thanksgiving or another occasion. Canned chick peas (no sodium added) can be used if you like, or prepare dried garbanzos from scratch. (It’s a cinch.) 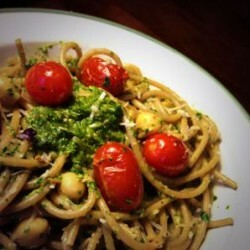 Measure out olives and raisins and prepare preserved lemon, sun dried tomatoes, and herbs. Cooking and Serving Notes. I often double this recipe to ensure I have enough for dinner, leftovers, and some for the freezer. You can also mix up the root veggie mixture (carrots are common) and add more or less garbanzos, as you prefer. Serve atop farro, quinoa, or brown rice, if desired.